mid '70s it came into its own…and it's still going." Photography used to be isolated, Gadd explains, separated from other art forms in museum exhibits. When at MMA, Gadd moved the photography out of the upstairs hallway and into more prominent view. "I like to integrate photography with other art," he says. "A lot more exhibitions now include photography and are themed multi-media." Maggi Weston's ever-growing collection drove up the price of photography, and she found herself one of the few women ar t dealers at the time, frequently traveling to New York auctions. "When I first went to New York, I was really nervous," she recalls. "Ansel called Harry Lunn, one of the greatest photography dealers, and he said, 'Maggi is coming to New York and I want you to take care of her.' When I got off the plane, he had flowers in his hand, he had arranged a place for me to stay, and he took me to London to the auctions and introduced me to the other dealers. I was very lucky." 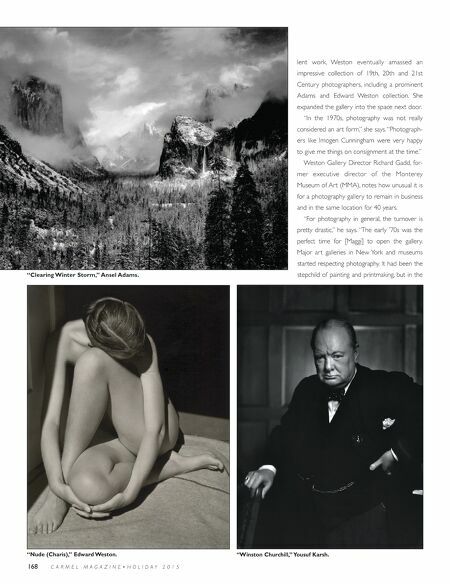 The gallery includes work by Yousuf Karsh, Chip Hooper, Carleton Watkins, Morley Baer, Wynn Bullock, Alfred Stieglitz, Paul Strand, Ryuijie, Rod Dresser, Maggie Taylor, Linda Broadfoot, André Kertész and many others. There are also many works by Brett, Cole, Edward and Cara Weston. Davika Weston helps run the gallery. "Cara practically sold out the last show," Maggi says. "Kim Weston is very well known. I'm so proud of both of them." For Weston, the gallery is a proud tribute to both current and past photographers, and many unique Carmel memories. "Ansel was always willing to meet other pho- tographers," she recalls. "He had his phone num- ber listed in the phone book, and at 5:30 every day he would hit the gong, and we would have drinks and any young photographer who want- ed to show his work could do so. He was a wonderful man." She characterizes Edward Weston's work as more modern. "When I first saw his work, it moved me to tears. I was hooked from then on. And of course, I realized the grandeur of Ansel's pieces. He gave us the [vision] of nature that made us look again and ask, 'What am I seeing?' The two were almost entirely different photographers, but they were great friends," she says. The powerful images— from landscapes, to nudes to still-lifes—endure in their abil- ity to inspire. "One can recognize the stars, they do things differently," Weston muses. "They are masters of their craft." The Weston Gallery is located on 6th Avenue between Dolores and Lincoln in Carmel. 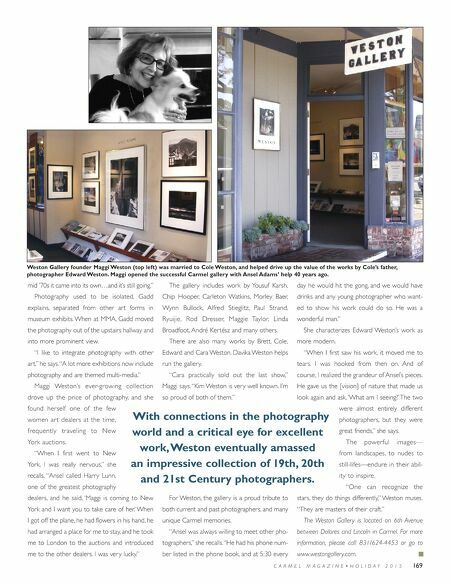 For more information, please call 831/624-4453 or go to www.westongallery.com. C A R M E L M A G A Z I N E • H O L I D A Y 2 0 1 5 169 Weston Gallery founder Maggi Weston (top left) was married to Cole Weston, and helped drive up the value of the works by Cole's father, photographer Edward Weston. Maggi opened the successful Carmel gallery with Ansel Adams' help 40 years ago. With connections in the photography world and a critical eye for excellent work, Weston eventually amassed an impressive collection of 19th, 20th and 21st Century photographers.